Two different vessels served as TS Indefatigable on the River Mersey. The Indefatigable was a school ship moored in the River Mersey in the 19th and 20th centuries. On it poor and orphaned boys whose fathers were seamen were trained for a life at sea. The first Indefatigable was built for the Navy at Devonport in south-west England and launched in 1848. She retired from active service in 1857 and in 1864 arrived at the Sloyne off Rock Ferry on the Mersey, on loan from the Navy . An inspection in 1912 showed that this ship needed replacing. She was towed away early in January 1914 to be taken apart. The second Indefatigable was built of steel on the River Clyde in Scotland and began service in the Royal Navy as HMS Phaeton in 1886. Phaeton was decommissioned in 1888 and used as a Stoker Training ship until 1903, after a spell she was stripped of all serviceable material. Although she was a steamship she was also fitted with sails. HMS Phaeton was withdrawn from active service in 1903 and sold to the Indefatigable Committee for £15,000 (worth over £915,000 in 2001). Mr James Bibby put up the money and bought Phaeton to replace the now defunct TS ” Indefatigable” on the Sloyne, River Mersey, Phaeton was towed to Birkenhead for fitting out as a Training Ship in 1913 and then anchored out at Rock Ferry in 1914. The second Indefatigable took over from the first in the Mersey off Rock Ferry pier on 15 January 1914. Phaeton’s top masts and Royals were removed at Plymouth during the stripping, we surmise the Ship owners Committee would think the height a bit daunting for such young boys, (although looking at the Wooden “Inde” the height was something there). The bow sprit was removed sometime in the 1920s, as the late Bill Smith 1936/38 said it was removed before he joined in 1936, at school age he went with his Mother on Prize day to visit his brothers who were also “Inde” boys and he didn’t recall them being there then. Captain John Clint had the idea of establishing a training ship specially for poor and orphaned boys in 1864. He was an important person in Liverpool’s charitable world. He had already helped set up two other school ships: the Akbar and HMS Conway. Liverpool shipowner James J. Bibby donated £5000 (the same as around £254,000 in 2001) to convert the first Indefatigable from a warship into a training ship. Later he bought the second Indefatigable as well as paying for its re-fit. Captain Groom was the Indefatigable’s first captain. His wife went on board with him because it was believed that the boys needed some feminine guidance. The Indefatigable had enough room for 300 boys though the original aim was to admit 200. The Indefatigable’s governing body insisted that the boys it trained were of good character. This clearly set the Indefatigable apart from the Akbar and the Clarence which were both reformatory ships for boys with criminal records. Indefatigable boys received a normal education as well as training in seamanship skills. Over 14,000 boys were trained as seamen on board the Indefatigable. 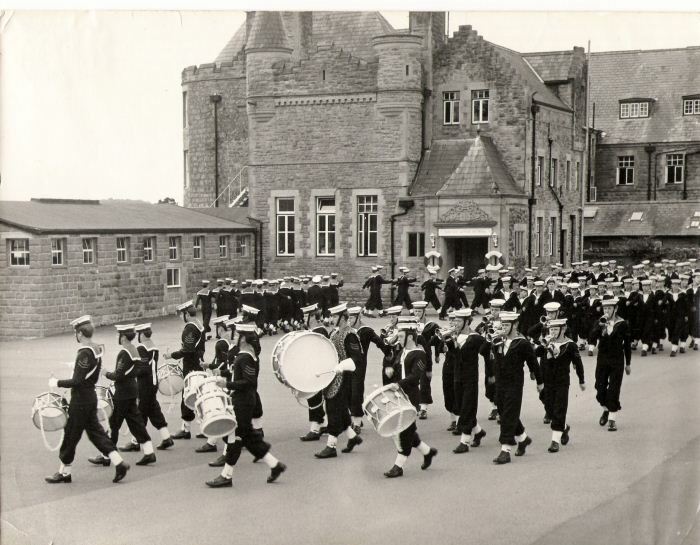 Most of the boys went into the Merchant Navy on leaving the ship, though some joined the Royal Navy. Being moored in the River Mersey meant that the training ship Indefatigable was at risk during bad weather. In 1873 the Indefatigable broke her moorings and was so badly damaged that she remained in dock for eight months. No new boys were admitted during this time. The Indefatigable continued to train boys in seafaring until 1941. Then the heavy bombing of Liverpool during the Second World War made it unsafe to stay in the River Mersey. The school found temporary premises near Ruthin in Wales and then moved to a mansion at Plas Llanfair in Wales in December 1944. The earliest record of “Ty Mawr, otherwise known as Plas Llanfair” is in 1673 when it was the property of Humphrey Morris and his wife Myddanwy. They were evicted in 1728 for non-payment of their mortgage! The property passed to a Rowland Jones who died in 1742 and who was succeeded by his nephew Hugh Jones. Jones sold it to Owen Lloyd, rector of Llansadwrn, for £720 in the same year. . At an unknown date John Hampton-Jones purchased the property, consisting of 120 acres (so it must have included the farm as well as the current grounds), and then sold it to his brother-in-law, John Lewis in 1771 for £1200. At some stage between 1771 and 1796 the estate became the property of the Earl of Uxbridge (who was Wellington’s second-in-command at Waterloo and who went on to become Marquis of Anglesey) and he rented it to Colonel William Peacock in 1796. 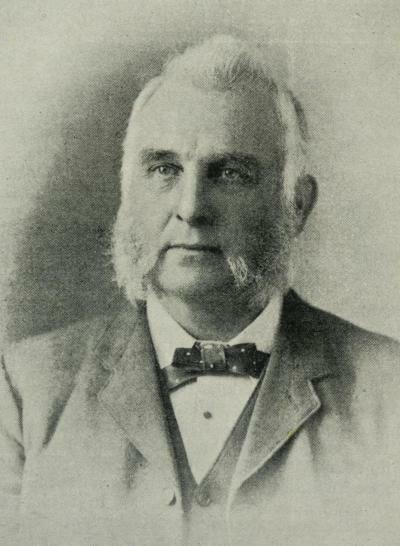 Peacock came from County Clare and was Commander of the Anglesey Militia. He had the fireplace in the Ante Room installed at a cost of 3 guineas, and continued renting the house until his death in 1826. The following year, 1827, J Clough from Denbigh rented the estate, still comprising 120 acres, but in July 1831 his tenancy was terminated because of an argument over alterations which he wanted to carry out. In 1853 ownership of the estate (valued at £6540) was transferred to the Marquis of Anglesey’s son, Lord Clarence Paget, who himself went on to become Admiral of the Fleet to Queen Victoria. It was he who erected the Statue of Nelson, which stands along the shore, in 1877. The property remained in the hands of the Paget family, but was rented to successive tenants. Mr Harry Clegg resided in the house over the turn of the century before dying and being laid to rest in St Mary’s churchyard just behind Nelson’s statue in 1909. In 1910 Mr John Horridge JP rented it for £400 per annum and he sub-let the farm for £132. In 1928 the first Friesian cow (named Melrose Diana) was brought to Anglesey by Mr Richard Edwards who was the tenant of Plas Llanfair Farm. She was struck by lightning and killed while grazing on the front lawn of the house! The house was leased to Mr Mortimer of Manchester in 1937. He had it converted into a country house hotel and had the swimming pool built. The hotel was fined £10 for selling drinks to non-members soon after being established! It was commandeered by the War Office during the Second World War and used for unknown purposes by the US Army until they departed after D Day. In 1944 it was leased to Indefatigable, an establishment which trained boys for a career in the Merchant Navy and a short history of Indefatigable is given below. 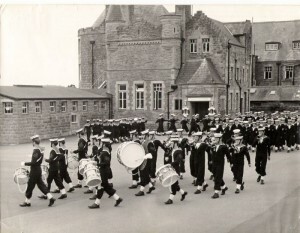 The School closed in July 1995, after which the property was on the market- for a year before being purchased by MOD as a replacement for the old Joint Services Mountain Training Centre at Tywyn. However, in purchasing the property, the MOD agreed to retain the name in the title of the new establishment; hence The Joint Service Mountain Training Centre Indefatigable. In 1983, the Indefatigable Old Boys Association (IOBA) was created by the late Pat Purser 77/91 (Teacher) and an annual reunion is held at the school each year where the Ministry of Defence gives ex-students access to the old school. In 1989 new classrooms and sports facilities were built and the age of entry was lowered to the age of 11. However, the numbers continued to fall to around 120 in 1994/5 with an estimated 100 for 1996. The school could not carry on with these numbers, and at the end of term in 1995 the school was closed. The school was purchased by the Ministry of Defence in 1996 and renamed The Joint Service Mountain Training Centre (JSMTC) Indefatigable. A £4 million refurbishment began in July 1998 and the first students arrived in April 1999. The Nuffield Trust partly funded the cost of the refurbishment. Members of the ‘Indefatigable Old Boys Association (IOBA)’ still use ‘JSMTC Indefatigable’ to this very day for Annual Reunion’s. Our extreme gratitude goes to the MOD for letting us continue this. By now I hope you’ve had time to digest our website, ‘Indefatigable’ as a School is no longer, but the we live on strong. As of May 2014 the Indefatigable records rest under one roof along with other Indefatigable archives, where they are at the Merseyside Maritime Museum (MMM) at the Albert Dock – Liverpool. We have signed an agreement with the MMM, that the records are now on a permanent loan to them, BUT we are to have with full access rights’, all within the strict Data Protection Act criteria. We do feel that the MMM is the natural location for the records along with many other Indefatigable archives that were already there, from a nautical perspective. Sheet No. 9 : Training Ships and Educational Establishments In 1857 the Liverpool branch of the Mercantile Marine Service Association was established in order to improve the competence and standards of the ships, officers and men. One aim of the Association was to establish schools for the training of boys and men for careers in the Mercantile Marine. Training Ships There were four educational ships moored in the Mersey during the latter part of the nineteenth century. The training ship HMS Conway , founded in 1859, became a national institution for the training of future officers of the Merchant Navy. There were also two reformatory ships – the Akbar , for the reform of Protestant Boys, and the Clarence , for Roman Catholic Boys. The fourth training ship, moored on the Mersey, was the TS Indefatigable , a charitable institution founded in 1864, to give sea training to boys in poor circumstances. TS Indefatigable (Liverpool Sea Training School for Boys) In 1864 John Clint, a Liverpool Shipping Owner, founded a charitable institution to train the sons of sailors, destitute and orphaned boys to become merchant seamen. The first TS Indefatigable was loaned by the Admiralty and was one of the last of the Navy’s sailing frigates.Mr James Bibby contributed £5,000 to transform her from a fighting ship to a training ship and this was to be the start of a long association between the Bibby family and the School.The TS Indefatigable merged with the Lancashire and National Sea Training Homes in 1945 and records relating to both institutions are held in the Maritime Archives & Library. Committee Registers, 1906 – 1949. Minute Books, 1913 – 1960, 1964 – 1984. Annual Reports and Accounts, 1901 – 1934, 1941 – 1988. Articles of Association, 1913 – 1952. Register Books, 1865 – 1990 (subject to access restrictions). Visitor Report Books, 1865 – 1978. Punishment Books, 1951 – 1995 (subject to access restrictions). Boys Discharge Book, 1961 – 1986. Medical and Dental Registers, 1937 – 1970 (subject to access restrictions). Further records regarding the TS Indefatigable are held in miscellaneous collections.Please see Guide to the Records of the Merseyside Maritime Museum , Vol. 2, p. 95, for information. I recommend a personal visit to the archive and library but they also offer a free postal and email enquiry service. From Monday 3 November 2014: The Maritime Archives and Library will ONLY open Monday & Tuesdays, 10.30-4.30, with lunchtime closing 12.30-1.30pm. They will not be open on bank holidays. Anyone can access the website and use the search facility for free. A charge is then made to see a full transcript or a scanned image of the original admission book.Free access to the transcripts or scans is available within the Maritime Archives & Library at the Merseyside Maritime Museum. Also many local libraries have free access to the whole website.It is a large website, so it can be difficult to narrow down the search to just the Indefatigable records. This should make it easier for people tracing their Indefatigable ancestors who cannot visit the Maritime Archives & Library. Those who do visit us will no longer have to struggle with the microfiche copies. Please note the later admission registers, those less than 100 years old, are still covered by the Data Protection Act, and so were not included in this project. They are still subject to access restrictions.